On the first day of beginner band when the woodwind players are handed their first reed, announce that the class will be conducting an experiment for the extent of the school year. Begin by opening a new reed and placing it in a plastic bag. Explain to the students that your reed, like theirs, is brand new and free of hazardous mold or moisture. If correctly stored after every rehearsal, the reed will have ample opportunity to dry out and will not become dangerous. Take this time to show students the proper way to insert the reed back into its plastic case; handle the thicker end rather than the delicate edge. Next, use an eye dropper (or similar instrument) to drop a single drop of water into the bag. Explain to students that this simulates the approximate amount of spit left on a reed after band rehearsal. This will be done once a day for the entire school year. Seal the bag and place the reed on a visible bulletin board near the entrance to the band room. Within the first week, have the students hypothesize what might happen to this reed as it continues to collect moisture. What color will it turn? How soon will it grow mold? Discuss the dangers of putting moldy objects into one’s mouth and the many lung conditions that might result from long-term exposure. If the students have a notebook or planner, have them notate changes in the reed’s appearance over the course of the year. 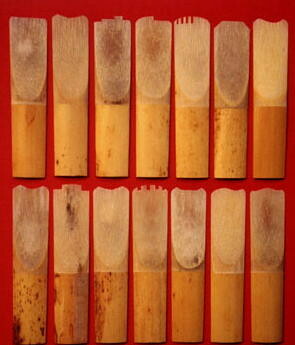 After approximately two weeks, the reed will have changed from a bright tan shade to medium brown. Allow students to feel the reed through the bag to inspect both sides for mold and determine if its texture is different. Encourage notes on the change in color and discuss what future changes might occur and on what timeline. Take this opportunity to remind students to wash their mouthpiece out once a week and to put their reed away after every rehearsal. Once the reed has been soaking in water for about a month, students will start to notice a clear film of mold covering both sides. The reed will begin to stick to the bag when squished and will bend more easily. While the color of the reed might not have changed from brown in several weeks, point out to students that a subtle danger has been growing on any reed that is not given the opportunity to dry out. Educators should consider handling the experiment carefully from this point on to ensure students are not directly exposed to mold. After approximately two months, the reed will turn black. Large mold spots will be visible to the naked eye and the reed will feel soft to the touch when the bag is examined. Fibers in the reed will start to split apart and the standing water in the bottom of the bag will be a dark brown color. At this point, it is not recommended to continue opening the bag daily. Instead, allow the reed to stew undisturbed. Encourage students to notate the enormous change in the reed’s appearances in their notebooks and make predictions about the remaining months. Most likely, this is the last major change in the reed’s appearance. For the remainder of the year, expect the reed to slowly break apart in its bag while the moldy spots expand. Consider a short presentation on the many kinds of mold and remind students that proper reed care is imperative to their personal health. Before the last grading period in the school year, contact one of the middle school science teachers to discuss your class’ experiment. Explain to the science department that your students have been exploring the results of unhealthy habits using the scientific method. Offer to donate your experiment to their classrooms to be turned into slides for a microscope unit. Encourage students to examine the moldy slides up close and report back with exactly what hazardous materials were grown. The science teachers at Center ISD reported a spike in interest in the microscope unit throughout the sixth grade when the reed slides were introduced. Students from the band department were encouraged to present findings on different types of mold and the best ways to prevent its growth. This cross-curricular experiment, in my opinion, was a success. Students would run to the band room to check for changes in the reed's appearance and often brought beginners from other instrument sections to have a look also. Even in the first month of the experiment, clarinet and saxophone players could be heard scolding one another to swab their instrument and place their reed in its proper place. As the year progressed, students regularly asked for help cleaning their instruments (especially before concerts) and zero moldy reeds were found during mouthpiece checks. I highly recommend this experiment to any middle school reed instructor; students were excited and learned hands-on how quickly poor habits can become hazardous.